My experience of Kylie’s second ever set of Christmas gigs was so special that I will never be able to forget it; and mostly because I was lucky (lucky lucky) enough to take along my 5 year old niece (and fellow superfan) Florence to her first ever concert. Seeing such a wonderful experience through the eyes of a young child was so moving; I truly think on my deathbed when I think back on my life experiences this will feature up there as one of the most magical I’m likely to ever to have. The excitement reached fever pitch even in the run up, with frantic rewatching of last year’s concert on YouTube and outfit planning; and as Florence rightly announced “Kylie Minogue is the biggest popstar in the whole world”. I met my sister outside the Royal Albert Hall, who dropped off her daughter leaving her in the care of myself and Ms Minogue for the evening. Before we’d even entered the venue Flo pointed in the window; screeching at a white tutu covered in musical notes “Auntie Cha Cha! It’s my favourite dress of Kylie’s from last year!!!”. We showed our tickets and went straight to the merch stand; Florence left with a programme and badge set whilst her slightly older Aunt left with the same plus a t shirt. We had our photograph taken posing with the tinsel dress featured on the Kylie Christmas: Snow Queen Edition reissue album; and Florence basked in the compliments she received regarding her sequinned bomber jacket (she was mildly annoyed with me for not wearing my matching one). We bumped into several other fellow Kylie fans who all wanted to know Florence’s thoughts on what was about to happen. We chatted with the chaps sat in front, a lovely couple who’d flown over from Holland for the show who were both very impressed such a small girl was a huge Kylie fan. Florence decided to entertain them with a rousing rendition of Little Donkey and her favourite Kylie hits whilst we waited for Kylie to take the stage. The lights dimmed and Florence gripped tightly onto my arm, shaking with overexcitement as I said to her “that means she’s coming on stage” and right on cue Kylie entered stage right. She started proceedings with “It’s The Most Wonderful Time of the Year” as Florence exclaimed “I love this one! !” and we both danced and sang along at the top of our lungs. By the third song (“Santa Claus Is Coming to Town”) Florence leaned over to me and whispered “I think this is better than last year; the costumes are MUCH more Christmassy”. She also took great delight in pointing out every single time the setlist deviated from the previous year; which is exactly the level of detail I want to be having in a conversation with my five year old niece. My highlights of the first half were “Confide in Me” performed as the original single version and “Better The Devil You Know” dueted with Olly from Years and Years. Florence preferred “The One” (despite being unfamiliar with it she couldn’t stop singing “love me, love me, love meee” afterwards), the HEY! bits of “Christmas Wrapping” and “Celebration” for which she was delighted when I told her seeing as she’s so small she was allowed to dance standing on the chair. Next up was interval time; Flossie reveled in learning all of these new and exotic terms. “Interval”, “duet”, “encore”; it was like her tiny mind had been opened up to a entire new world as she relished dropping these into conversation afterwards. During the interval on a quick trip to powder our noses Flo was delighted to spot two other little girls in the queue; as she smugly informed me once back at our seats “those kids were defo older than me Auntie Cha Cha”. Nails emoji! Part two kicked off with something that I never thought I’d see let alone enjoy…a duet of “Your Disco Needs You” with opera singer Katherine Jenkins. Last summer (after turning up to babysit her and her brother with rainbows painted on my face) I taught my niece about the importance of gay pride. Florence was as pleased as punch to point out the significance of the rainbow flags on the stage. I’m proud to reveal that YDNY is now her favourite Kylie song – apologies to “Hand On Your Heart”! She also massively got into “100 Degrees”; during the intro I asked Flo if she thought Kylie’s sister might duet with her…she then innocently said to me “Is Britney Kylie’s sister?”. Close Floss. Close. During “Let It Snow” poor Florence looked crestfallen to see that it did not actually snow. “Never mind she said” as I tried to distract her with chocolate buttons. Her attention was soon alerted when I pointed to the giant disco ball high up in the roof of the iconic venue…. “Look Florence; it’s coming down!” I exclaimed and my young niece gasped as we were suddenly in the midst of the biggest disco in town as Ms Minogue belted out her cover of “Night Fever”. Act Two came to a close with “All The Lovers” complete with confetti drop. Whilst Florence was suitably impressed she asked if it was time to go home (it was three hours past her bedtime); “Not yet Floss; don’t forget about those balloons!!”. Once the encore was up all of a sudden something really magical happened. As Florence has been informing anyone who’ll listen ever since Kylie Minogue made it snow indoors. Whilst singing “Silent Night” no less. It really did seem made for the venue as my niece and I held hands and sang along. Kylie then moved onto a duet of “Especially For You”, dueting with the audience instead of Jason Donovan. I suppose it was her fiance’s birthday (Flo had taken great delight in joining the room to sing happy birthday earlier on) so wheeling out her former beau might have been a faux pas. Luckily Florence has received an excellent education so was more than able to duet with her idol. She ended the show with a rousing cover of “I Wish It Could Be Christmas Everyday”; and finally a very tired little girl saw her dream of balloons descending from the ceiling. “Next year Auntie Cha Cha perhaps we can sit nearer to the balloons” was Florence’s very matter of fact answer as the final applause ended and she beamed me a big smile. Big shout out to Stephen Smith for gifting Florence with one of the aforementioned special balloons! How does one even begin to write about the best gig that has ever been, or will ever be? I may be prone to hyperbole (and might be slightly biased as a Kylie superfan) but that’s exactly how I feel right now. I feel like spending the day shaking and crying in a darkened room as surely nothing could reach those dizzying heights ever again? *Correction* An as approved by Dannii Minogue designed t shirt. The first special guest appeared towards the end of Act One, when Chrissie Hynde joined Ms Minogue on stage for a duet 2000 Miles exclaiming “This is a dream come true!” Fun fact. When I was a child and I’d see Chrissie Hynde on the telly I thought she was my Mum as they have the same name (and hair do). Anyway, I’m pretty sure it wasn’t my Mum duetting with La Minogue last night. Act Two kicked off with Kylie reemerging on the stage wearing a floor length gold sequin cape. I’ve seen enough pop spectaculars to know that cape wasn’t staying on for long… The song ended and, as suspected, Kylie whipped the cape off to reveal a sequinned red disco gown reminiscent of the one she recently wore for her performance of 100 Degrees on Australian X Factor. Could it be…. Could Dannii have trolled us all with her recent Twitter posts and could she have snuck on a Melbourne to London long haul flight… Sure enough the beats of the modern Christmas disco classic echoed around the Royal Albert Hall and before we knew it THERE SHE WAS! The siblings reunited live on stage. I don’t think I’ve ever heard an audience reaction that loud (except for perhaps Kylie’s first post cancer UK concert appearance which I was in attendance at); I personally felt like I burst a blood vessel by screeching so loudly. When the song ended Kylie revealed that her very special guest had even been kept a secret from her parents and brother who were in the audience chuckling “It’s hard enough keeping one Minogue a secret, but imagine two of us!”. Keeping the disco spirit alive Kylie trilled her way through some of her most popular uptempo hits Spinning Around and Your Disco Needs You before slowing things back down with Santa Baby (which has never been a favourite of mine – sorry Kylie!). However, all was redeemed when Queen Minogue showed JUST how magical she is by actually making it snow within the Royal Albert Hall. Strangely the song she chose to show off this feat was Let It Snow – move over Jesus!! The next MAJOR highlight for me was the ballad version of I Believe In You which is in my top five Kylie songs ever. It’s normally magical enough but to hear it in such an illustrious setting with amazing acoustics and live orchestra is something that’ll stay with me for a long time. As if this wasn’t ethereal enough she wore an actual crown and long flowing white robes whilst mist circled around her perfectly formed ankles. For her encore she sang Especially For You with the audience taking Jason’s part (I guess she didn’t want to parade Jason Donovan in front of new love Joshua Sasse); followed by a rousing rendition of I Wish It Could Be Christmas Everyday for which her younger sis bounced back on stage. Especially For Yule instrumental 😍 @kylieminogue #kyliechristmas If only Jason had stormed the stage and spun her around! As if both singing Minogues on one stage wasn’t exciting enough, not content with making it snow Kylie Ann also made it rain balloons. Call the Met Office, our glorious leader has managed to invent a new form of weather! Everything about this show was perfect. The setlist, the costumes, the dancing, the arrangements, the special guests (and lack of them *cough* James Corden), the audience reaction completely blew me away – it was truely faultless and something I won’t forget in a hurry. Kylie entered the stage as a princess, and left it (arm in arm with her new love) as the true Queen we know her be. This is something I don’t really like to talk about but I am a Kylie Minogue superfan. I’ve loved her since I was 7 years of age and can’t ever imagine her not being a part of my life. I’ve been lucky enough to meet her once before (at her Harrods book signing back in 2012); but other than that my fandom has been confined to attending concerts, listening to her music, the occasional Tweet from her, writing freelance articles about her and having my cover version of her single All The Lovers featured on Popjustice. I woke up Saturday morning with a mild hangover and with no idea how the rest of my weekend was going to pan out… At around lunchtime I saw a Tweet from Liberty saying a competition was being held for 30 winners to attend the unveiling of this year’s Christmas window display which the queen of the universe was commandeering. I hit the retweet button, gazed longingly at my Kim Kardashian West prayer candle and hoped for the best. Fast forward to 6pm and I was sat on my Kylie At Home bedsheets (leopard print, obvs) and applying my limited edition Kiss Me Once lipstick when I saw a notification appear on my phone… “Congratulations!!! You’re going to meet Kylie tomorrow!” I immediately turned into a shaking, gibbering mess and my heart was pounding. Although I’d met my idol before, I’d never had a photograph with her that hadn’t involved me photoshopping myself into it…was this finally going to be my chance? My mind was filled with a million questions and all I had was a time and an address to meet the following morning and an instruction that due to security no phones or handbags would be permitted. I barely slept that evening, and woke up super early feeling like a child on Christmas Day. I was shaking as I selected a t shirt I’d designed myself to wear which I accessorised with a red sparkly giant Christmas hairbow I’d already purchased for her concert at the Royal Albert Hall next month. My journey was an unmitigated disaster. I left with twice as much time as needed but due to road closures by 11.15 I was still stuck in an Uber near Westminster; at one point I really thought I wasn’t going to make it and I think the poor driver was quite taken aback by my hysterics (fingers crossed it hasn’t affected my 4.9 rating!). 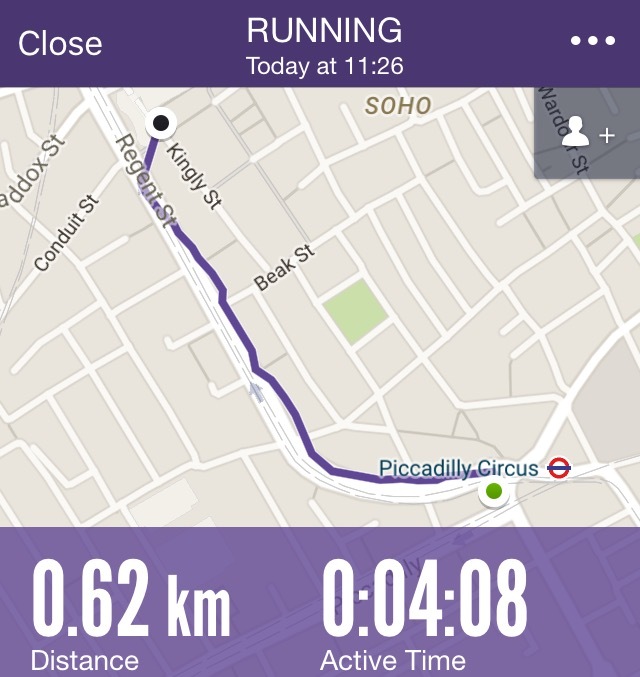 At 11.26 I finally got out the Uber at Piccadilly Circus and proceeded to RUN up Regent Street. Anyone who knows me will testify I don’t run but please see the evidence below! We were ushered upstairs to the 4th floor and escorted into a small ornate side room with three rows of chairs, a pink sparkly Christmas tree and two arm chairs at the front. 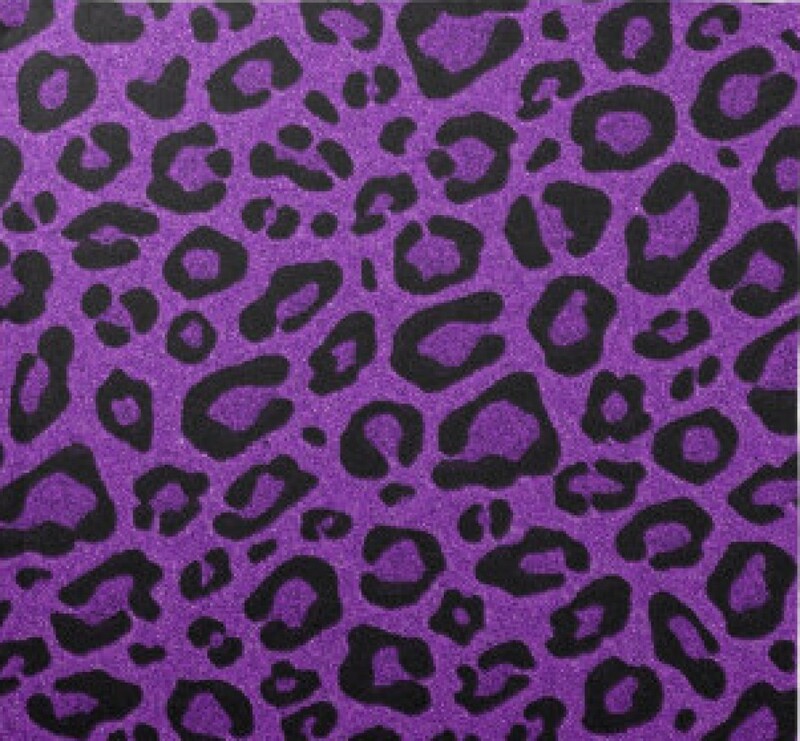 On each chair was a small purple Liberty giftbag that contained a deluxe edition of her new album Kylie Christmas. I was lucky enough that two of my friends Danny and John had also won tickets so I sat with them and we chatted to the people around us as we made the most of the complimentary pastries and beverages. 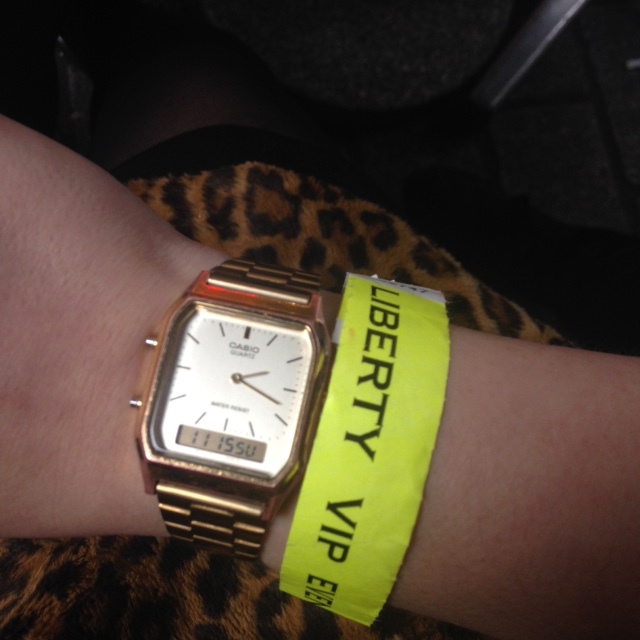 At around 12.15 a buzz went around the room… She was on her way! First into the room was her new exceptionally handsome boyfriend Joshua Sasse who lingered at the back staring at her adoringly. Seanny Sean her tour manager was also accompanying her. A representative from Liberty brandishing a microphone came out and introduced her as the entire room stood to give her a standing ovation as she entered the room. “Sit down, sit down!” she said as she took her seat. The representative from Liberty proceeded to interview her; I presume for their website as the entire event was filmed. Kylie explained that she’d decorated the pink sparkly Christmas tree herself as part of a charity initiative for ITV’s Text Santa. My Christmas tree always features my Ms Minogue Barbie doll dressed as an angel but I guess Kylie was going for a more understated appearance for her interior décor. The interview itself was mainly about her thoughts on Christmas and Minogue family traditions. The most revealing part which had the room howling was probably that her ideal Christmas day would involve “spending the morning in bed, then I’d take it from there”. Also, world exclusive, on her Christmas list this year is a wick trimmer which I initially misheard as “wig trimmer”. I was sat in her direct eye line, and each time we got eye contact my inner 7 year old died a little. When the interview ended it was time for the meet and greet part of the session, and each person got to go up to the front one by one, row by row. After the first photograph was taken Kylie took command to alter the set up as there was a table with a floral arrangement on between the two chairs. “This isn’t working. Let’s move this table” she said. “The guys will get a much better picture if the chairs are closer together”. Thanks babes! Eventually it was my turn and as I sat down next to my idol it struck me how much this reminded me of a Santa’s Grotto, but with an opportunity to meet someone much more glamorous and fragrant than Father Christmas. Being a responsible Aunt I have brainwashed my four year old niece into being a Kylie fan too; and when she found out I was meeting our shared idol she burst into tears, informing my sister “That’s not fair, Auntie Cha Cha has already met her”. 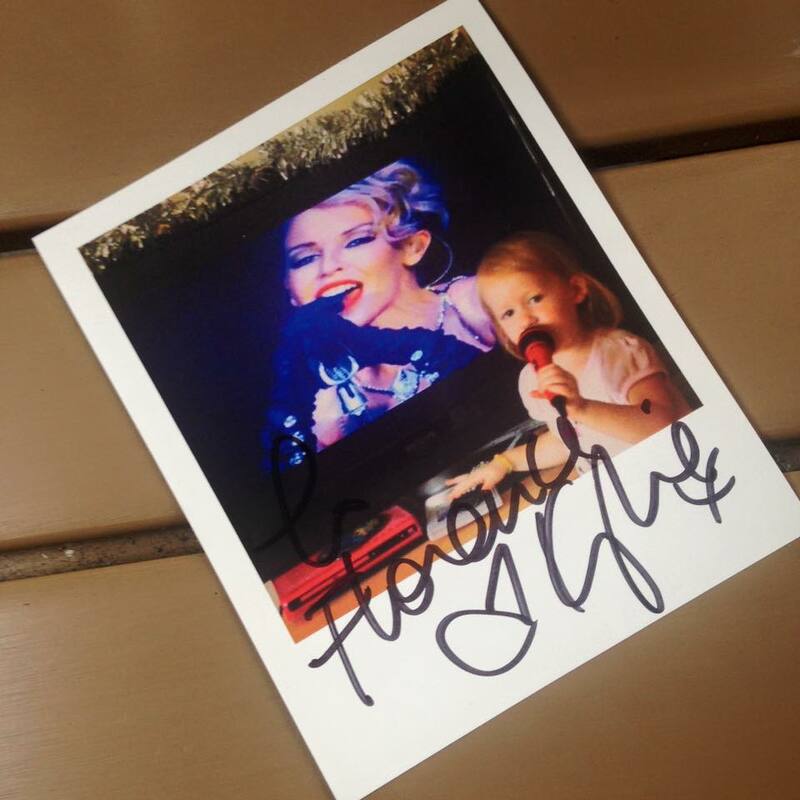 I handed Kylie a photograph of Florence singing into a microphone with Kylie on the television screen behind her. “Oh my goodness, she’s so cute!” said Kylie and she looked horrified when I told her she was upset she couldn’t come due to the no plus ones policy. “Why couldn’t she come? It’s not a school day” was Minogue’s response as she dedicated the picture to Florence and we talked about how much fun being an Auntie is. As a side note Florence is not sure that Kylie did indeed sign this herself as she’s not sure that Kylie would be able to spell F-L-O-R-E-N-C-E, but at least this is a great souvenir for when she’s feeling less sceptical. The next item I’d bought with me was a bit of a gamble as I handed Kylie a photograph of some artwork I’d created in which I’d superimposed myself into a photo with her and Dannii. “Please don’t be alarmed by this” I warned as I handed it over. “What is this? And how did you do it?” asked Kylie as she raised the picture to her perfectly formed face to inspect closer, as she cackled away. “Oh just a little something I created using a phone app” I retorted as my brain envisaged the nail varnish emoji. “I always fancied being the third Minogue sister”. “I can see that!” giggled Kylie. Other items that she signed were the Christmas CD she had gifted me with and also I bought the insert she’d created to replace the dire cover for her Greatest Hits 1988-92 album. “This is a blast from the past!” she informed me as she signed the collector’s item. We posed for the professional photographer who took some pictures of the two besties and it was all over. 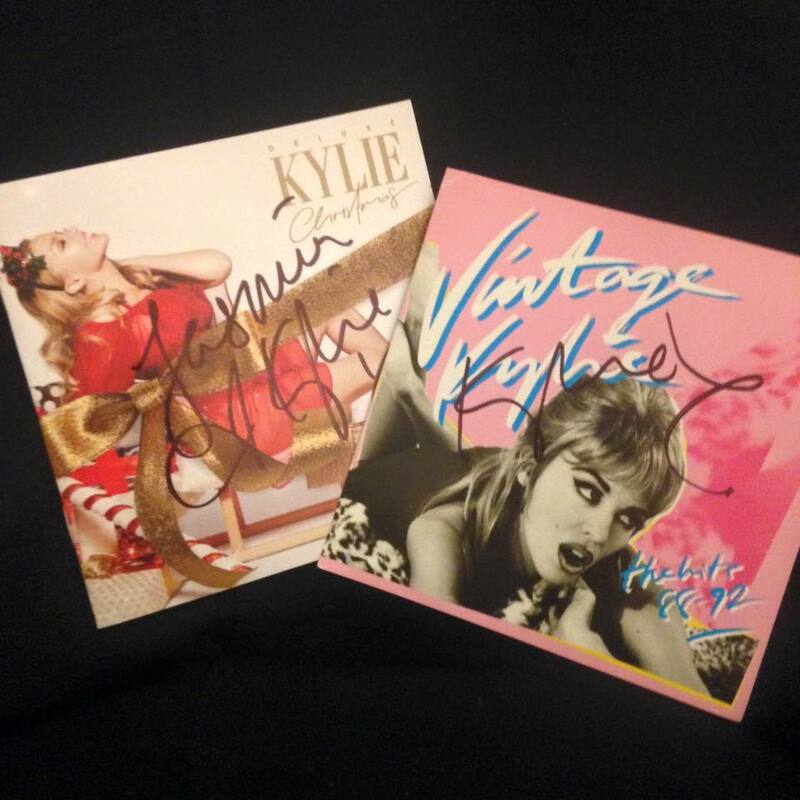 “Thank you so much Kylie!” I said, “I hope you have a fab Christmas”. “You too!” said Kylie as she beamed her magnificent smile at me. And that was it. The whirlwind was over and I exited the room. It all seemed so surreal and dreamlike. I only hope that when the photographs are e-mailed to me later this week I’m not pulling an odd facial expression. But, hey, even if I am at least La Minogue approves of my photoshop skills!